Roof Exhaust Fans – Safe-Grain, Inc. This is the best roof exhaust fan you can buy. 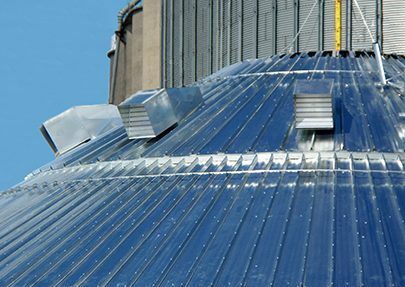 The SAFE-GRAIN power roof exhaust fan is designed to sweep moisture laden air from the underside of bin and silo roofs before condensation can occur. 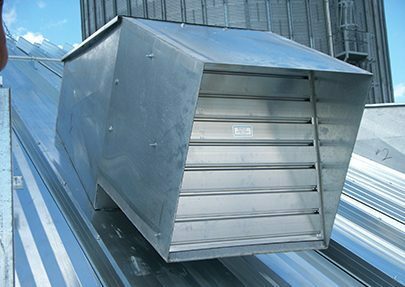 When used with main fans at grade pushing air into the silo and make up roof vents; the exhaust fans will significantly reduce the risk of grain crusting. When used with make up roof vents only; the exhaust fans will maintain uniform roof plenum temperatures. Available with either TEFC or Class II, Group G motors and flat or sloped roof housings; the cast aluminum blade fan and 16 gauge galvanized housing with aluminum shutter is designed for years and years of excellent service. 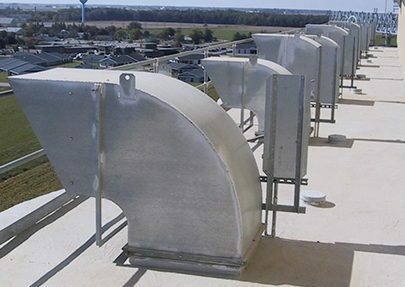 Exhaust fans sized from 3,000 CFM up to 45,000 CFM are available. Roof Exhaust Fans may be operated manually, automatically by thermostat, or by a Safe-Grain Relay Control Module interfaced with the SafeTrack grain temperature monitoring system. To obtain a custom personalized quotation, provide us with your requirements HERE. Roof Exhaust Fan with notched base mounting flange and self-closing aluminum shutter. Roof ribs are not cut. Roof Exhaust Fan with notched flange to allow highest mounting on ribbed roof.